Ardbeg and Longmorn , a perfect Combination ! Ardbeg independent Bottlings are getting harder to find , when Whiskybroker put this one up on line last Wednesday it sold out in 15 minutes . He also put several other Single Cask bottlings up at the same time , i was predictable and ordered the Longmorn……. Ardbeg 20yo Cask #434 , 46.6% , Distilled 16th March 1992 , Bottled 12th February 2013 , Outturn 222 Bottles . From a Hogshead , it is a light Gold in colour for it’s 20 years in the cask , well nearly 21….. The nose is initially peaty which is a bit of a surprise given it’s age ( normally the peat would have dissipated at this age and be more iodiney so may suggest a not very active cask) , quite citricy (Lemon) , there’s also a hint of the Ardbeg creamy Coffee ,chocolate and pine nuts . After a bit of breathing the peat subdues . More of the same on the palate , a tad more lemony , very relaxed across the mouth with the Ardbeg-dine appearing but still not as prominent as say in a 1970’s bottling . The finish is long with peat , lemon and creamy coffee. A very good Ardbeg which seems to have been in a decent cask given the time at which it was bottled ( Allied were filling mainly for blending so casks weren’t the best at times) . A BIG Thumbs up to Martin ! 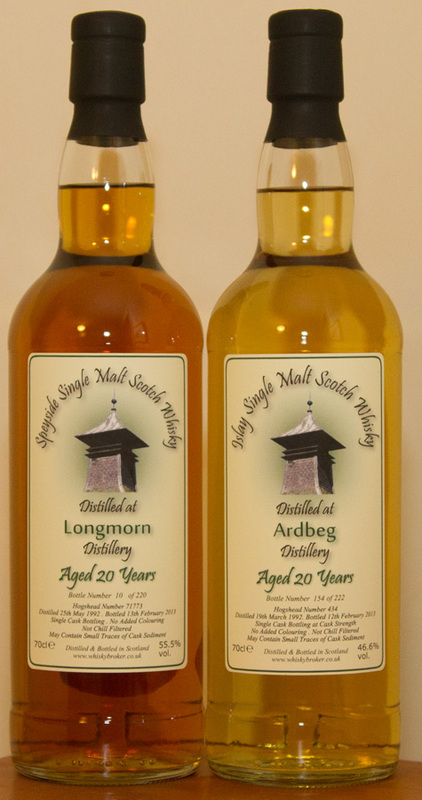 Especially at £65 a bottle…..
Longmorn 20yo Cask #71773 , 55.5% , Distilled 25th May 1992 , Bottled 13th February 2013 , Outturn 220 Bottles . The Longmorn is also from a Hoggie (same parcel as the last two i bought off Martin) , the colour is also very similar , The nose is quite sweet and spicy , lots of oak spices , almost bourbony , there’s opal fruits there as well . A really nice nose . The palate is almost identical , spicy and fruity , with a touch of wood . It glides across the mouth . The finish is medium with wood spices (bourbony) . A very good dram , i still wonder about this parcel , either it was special casks ( along the lines of toasted etc) or they were very fresh ones . Worth a punt at £44.60 a bottle .